From this act was born the San Bernardino Forest Reserve, which became the San Bernardino National Forest in 1907. The San Bernardino National Forest as public land was set aside for the conservation of natural resources such as trees, water, minerals, livestock range, recreation, and wildlife. Originally, the forest was home to Native Americans, since long before recorded history. Mexican and European settlements occurred sporadically for the first half of the 19th century, but the chain of events that led to the creation of the National Forest in 1893 really began after California became part of the United States in 1848 (it had been part of Mexico since 1822). A pioneering populace, who had conquered what seemed like an endless frontier, began to realize that it now must manage the land much more thoughtfully. A Board of Forestry report in 1886 found that “the necessity of the hour is an intelligent supervision of the forest and brush lands of California, with a view to their preservation.” Five years later the Forest Reserve Act made this preservation possible. 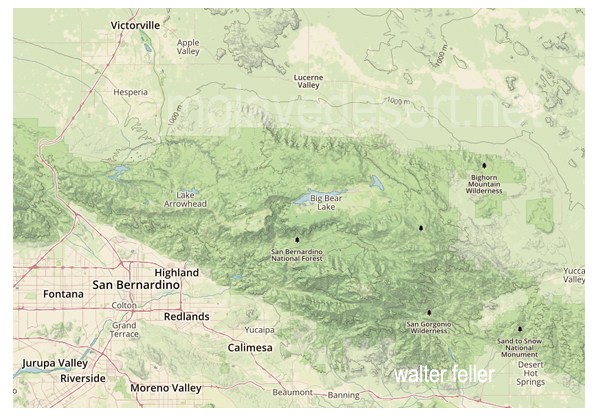 Today the San Bernardino National Forest is comprised of several departments and three Ranger Districts spanning 676,666 acres in San Bernardino and Riverside counties. Our Forest has Fire, Police, Planning and Permits, Recreation, and a Roads department just like a city, county or state government. In addition we have a scientific arm that deals with issues relating to cultural, water, soil, wildlife, plants and trees. The employees of the San Bernardino National Forest are tasked with protecting a huge area with a rich diversity of geographical features, flora and fauna. 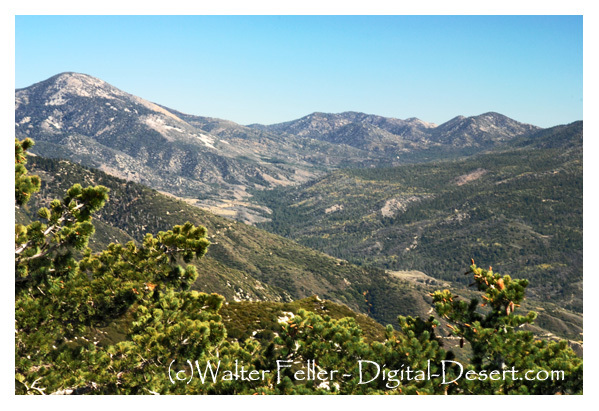 The elevations on the forest range from a few thousand feet to 11,501 feet at Mount San Gorgonio, the highest peak in Southern California. This large elevation range creates a wide variety of habitats in which plants and animals thrive. Indeed the San Bernardino National Forest is one of the most diverse in the country when it comes to types of plants and animals - everything from desert cactus to evergreen forest to alpine tundra can be found here, within a very short distance of one another. Wildlife such as the black bear, mountain lion, deer, and bighorn sheep inhabit the Forest while the bald eagle, peregrine falcon, and the red-tailed hawk soar in the wind. Today, the San Bernardino National Forest serves as southern California’s outdoor year-around recreation destination. Annually the forest receives more visitors than either Yosemite or Yellowstone National Parks! Even with high visitation, fortunately there are still many places to find solitude if that is what you seek. There are many ways to discover the Forest. Drive the scenic Rim of the World or Palms to Pines Scenic Byways which afford tremendous views. Hike a short nature trail or plan an extended backpacking trip in one of our eight wilderness areas. Camping, wildlife viewing, horseback riding, mountain biking, fishing, hunting, and OHV riding are just a sampling of the activities that the forest provides. And, remember, the fun doesn’t stop in the winter! The forest is the location of three downhill ski resorts, or you can try out cross-country skiing, snowshoeing, or just having an old-fashioned snow ball fight. Index of pages and articles relating to the Holcomb Valley.